Creative Writing Through Literature is proud to announce our newest curriculum! Adventures in Novel Writing! 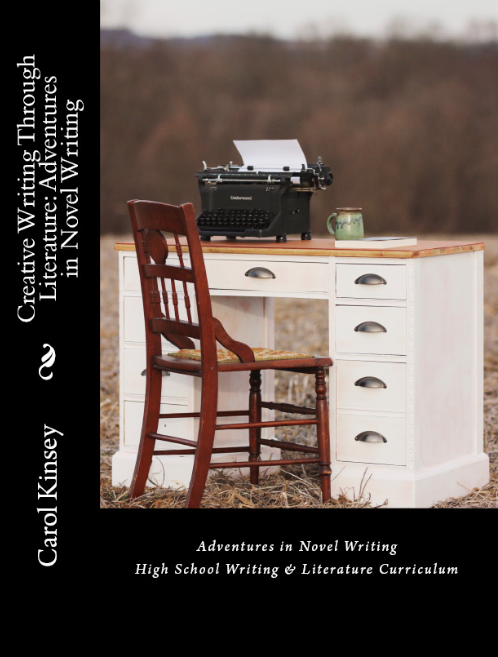 This new high school curriculum covers grammar, literature, vocabulary, and spelling, while launching your young writer into an adventure as an author! They will write their own short novel and learn ways to move toward publication! Students will read Witness Protection by Carol Kinsey, as well as four other novels of their choice. Check out Adventures in Novel Writing on Amazon – coming in April! 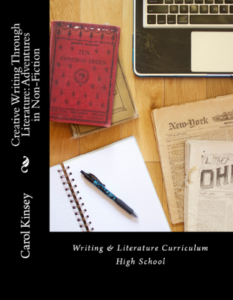 Creative Writing Through Literature is a comprehensive writing and literature curriculum for high school and junior high students. APA and MLA formatting, Journalism, memoir writing, narratives, and more! 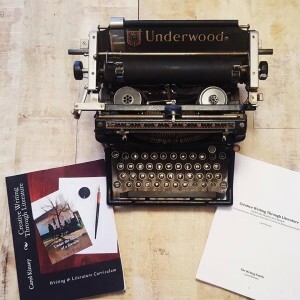 Adventures in Non-Fiction will prepare your high school student for college through a comprehensive high school curriculum that challenges your student while helping them cultivate their writing skills! Available through Amazon. Creative Writing Through Literature offers students an opportunity to strengthen their writing skills and develop a love for reading. 5.0 out of 5 starsLove this writing curriculum! By D. Hill on March 16, 2016 Format: Paperback. I had the opportunity to see this curriculum at a local homeschool gathering. 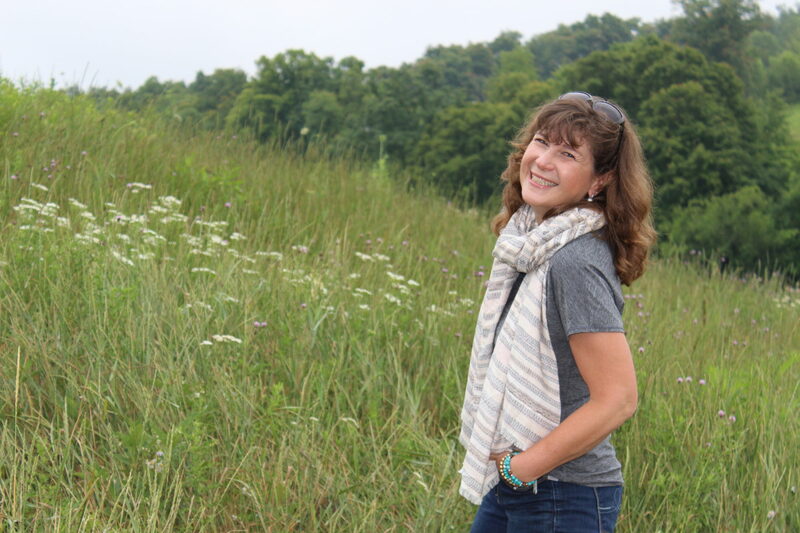 It is a fantastic writing curriculum and I love how it is laid out! It is divided into three units that include reading and writing assignments, vocabulary and tests. It has required writing assignments as well as optional assignments so it is flexible to your schedule. It is very well laid out and is student driven which is a plus for me, for my MS/HS student. I love that it is not the same thing week after week, but each unit is a little different! The first unit is centered on one of the author’s own novels, (which is a wonderful read!) and the next two units offer choices. This is a wonderful curriculum and I look forward to using it! By Amanda on March 11, 2016 Format: Paperback. I got to read through this curriculum from cover to cover and I kept saying to myself that I would have loved to have this kind of writing curriculum when I was young. It covers topics such as some basics of grammar, to vocabulary, to how to get your audience to see/hear/feel a situation with just your words, to even a touch of journalism. There are 3 units with a multiple choice test and a 5 paragraph writing assignment for each unit, and a final 8 paragraph writing assignment as a final assignment. The rubric for the writing assignments is clear and would be easy to use as a homeschooling teacher. Along with the unit writing assignments, there are several (optional) writing assignments included each week. They range from researching places they’re reading about in the assigned book to journal entries. I have also read Carol Kinsey’s book Under the Shadow of the Steeple that this curriculum uses. It’s a very easy read that I was immediately caught up in as I journeyed across the state and hid out in secret hiding places with the main characters. I will be using this curriculum when my son reaches middle school age, and I recommend it to anyone who is interested in learning how to write creatively. Student: Jason 5.0 out of 5 starsI loved doing this curriculum December 7, 2017. Format: Paperback. I loved doing this curriculum. I did it last year and learned a lot by doing it. I watched my writing skills grow as I continued though the curriculum. The lessons were clearly laid out and simple to do. I really enjoyed this writing and would recommend it to anyone.